Also known as the continent of Australia (not to be confused with the individual country which is a part of it), Oceania is Australia, New Zealand, and the Pacific Islands. It's a political continent rather than a geographic one, because it's not a huge landmass but a collection of islands and atolls. 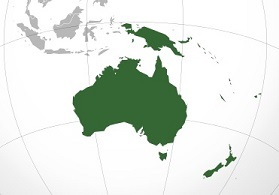 To confuse the terminology further, Oceania is often considered part the Asian region (but not the continent). 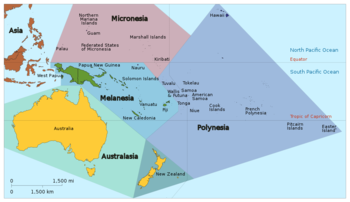 The islands are divided in three zones: Melanesia being the islands north and northwest of Australia (the Indonesian provinces of Papua and West Papua, Papua New Guinea, Fiji, Vanuatu, Solomon Islands, New Caledonia, Australia's Norfolk Island, etc. ); Micronesia, the micro-islands north of Melanesia (Federal States of Micronesia, Palau, Kiribati, Marshall Islands, Guam, Northern Mariana Islands, Wake Island, etc.) and Polynesia, with a lot of islands (New Zealand, Tonga, Tuvalu, Samoa, Cook Islands, Easter Island (part of the Chilean Valparaíso region), the US state of Hawai'i, French Polynesia, etc.). You might also hear the term Australasia, this being Australia, New Zealand, New Guinea (the whole island) and some neighbor islands, including some of Indonesia. Sometimes Australasia is used the same way as 'trans-Tasman' to refer to Australia and New Zealand alone, as seen in the region list below. Regarding tropes, there are few of them here. Why? The islands have achieved independence only in the 70's and 80's. With the exception of the biggest threenote Australia, New Zealand, and Papua New Guinea, every single country here has less than a million people, and most have less than 200,000. In fact, Oceania is the second-least populated continent on Earth after Antarctica and has the lowest population of the permanently inhabited continents, housing only 38 million inhabitants (in comparison, South America, the third-least populated continent, has 422 million inhabitants). Do not confuse with Oceania from Nineteen Eighty-Four, which comprises mutually exclusive territories.